WASHINGTON (CNS) — For adults complaining about America’s youth being saturated in media usage, it appears the apple hasn’t fallen far from the iPad. Parents spend more than nine hours a day with screen media, and the vast majority of that time is spent with personal screen media, according to a study issued Dec. 6 by Common Sense Media, a San Francisco-based organization that has long been tracking children’s media usage. Even so, according to the study, 78 percent of parents believe they are good media and technology role models for their children. When it came to parents’ screen-time use, 51 percent said they used it for eight hours or more each day, 30 percent said for four to eight hours, 13 percent for two to four hours, and 6 percent for less than 2 hours. Common Sense said it is possible for people — parents and children alike — to use more than one form of media simultaneously, such as listening to music while engaging in social media. Still, some groups’ habits skew the survey’s results. The notion of a nation of workers chained to their computer screens was dispelled in the study, which showed that only 1:39 was spent on work screen media compared to 7:43 on personal screen media. The most-used device by parents was the television, DVD player and/or video, for an average of 3:17. Groups watching TV for more than four hours were blacks, Hispanics, those whose education stopped at high school or earlier, and those making under $35,000 a year. Those parent groups spending the most time each day with media — in hours and minutes — were blacks (12:42), those making under $35,000 (10:21), those with a high school education or less (10:10) and Hispanics (10:01). The group spending the least time with media, at 8:13 daily, were those with at least a bachelor’s degree. Fifty-eight percent of parents said they listen to music while working, 48 percent sent text messages, 38 percent used social media, and 33 percent watched TV, the study said, while 63 percent reported their tweens and teens have their own cellphones, and 51 percent of them have their own tablet. Negotiating media use with their children causes conflicts for 37 percent of parents, according to Common Sense. Forty percent of parents of boys said that negotiating media use causes conflicts, compared to 34 percent of parents of girls. Only 35 percent of parents felt that technologies such as smartphones and tablets make parenting easier. While more than one-third of parents reported being “moderately” or “extremely” worried about their children’s internet use in a variety of ways, parents of “tweens” — defined in the study as children ages 8-12 — were consistently more worried than parents of teens. Forty-three percent of all parents say their kids spend too much time on media, the Common Sense Media study said. More than two-thirds, or 67 percent, of parents said monitoring their children’s media use is more important than respecting their privacy. Hispanic parents, the study said, tend to be more aware and more concerned, and they manage their children’s media use more than other parents — 60 percent for Hispanics as opposed to 37 percent for whites and 33 percent for blacks. “A majority of parents do report, however, that children are not allowed to use devices during family meals (78 percent) or at bedtime (63 percent),” the study said. 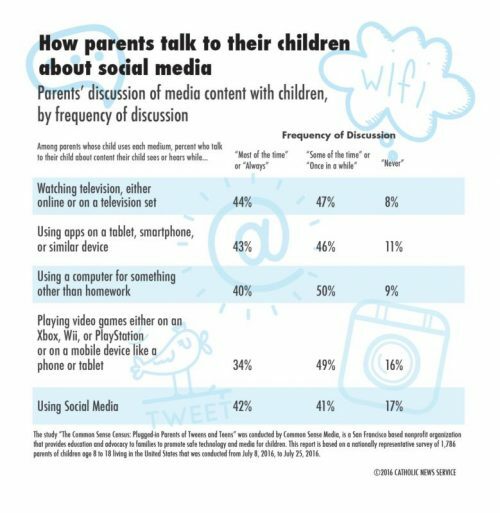 Parent media activities covered in the survey included watching TV, movies and videos, playing video games, listening to music, using social media, reading either print or electronic books, and using digital devices for other purposes, such as browsing websites and playing games. They also were asked about computer, smartphone and tablet use for work purposes. The media devices or technologies covered in the survey include video game consoles, handheld video game players, TV sets, desktop and laptop computers, tablets, smartphones, cellphones that are not smartphones, and e-readers. The survey, which can be found at http://tinyurl.com/jp3ywwn, also asked about print reading materials, such as books, newspapers and magazines.